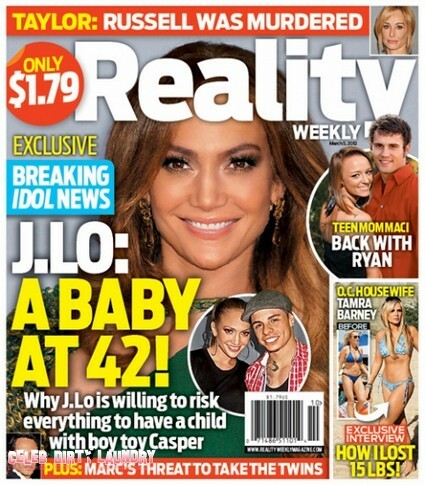 The current issue of Reality Week features the cover story ‘J-LO: A Baby at 42.’ The magazine claims they have breaking Idol News – on the details on why Jennifer Lopez is willing to risk everything to have a child with boy toy Casper Smart. The are also claiming that her ex-husband Marc Anthony is not happy over the situation and he is threatening to take their twins Max and Emme away from her. The twins appear to get along famously with Casper in front of the camera, their father is not as friendly with Lopez’s new boyfriend. Marc Anthony has expressed concern about Smart’s criminal record and even went one step further and banned Smart from driving Max and Emme. What do you think is Jennifer crazy to think about having children with Casper? Sound out in the comments below! Reality Weekly has more: In this week’s issue: 42-year-old Jennifer Lopez surprises everyone with some big baby news. Plus, a peek into one of the American Picker‘s secret life, an exclusive interview with Real Housewives of Orange County‘s Tamra Barney on her recent weight loss, and a look at whether Teen Mom‘s Maci and Ryan are getting back together. To find out all these details and more, pick up the current issue of Reality Weekly on sale now! Star Magazine: J-Lo’s Big Lie Exposed, Divorce Deal Blows Up!